It’s going to be a busy week at Henley Regatta! Today is set to be the hottest day of the year which is ideal for the amount of sporting and cultural events taking place over the next few days and weeks. It is also the reason why the Team at Team Tactics have been running backwards and forwards to the post office distributing tickets! Thank heavens for good weather. It makes everything that much more special. Hellen set off at 6am this morning for three packed days at Henley Royal Regatta where we have clients at the River Lounge and on board a number of Thames River Boats which we have been using for many years. 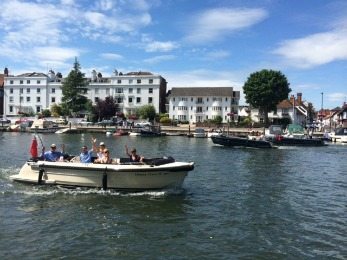 It is hard to think of a better way to spend a summer’s day than gliding through the waters of Henley with a Pimms or a glass of pink champagne ( as requested yesterday at the last minute) in your hand. Ferrying people between marquees and boats during the Regatta is always a challenge however the clients love the occasion and the menu selections we have seen along with the wine lists mean that our clients along with their guests will have a day to remember. Team Tactics has always loved Henley Regatta and it is a favourite of many of our clients who come back year after year for that little bit extra. No sooner than Henley Regatta is over than the Henley Festival of Music and Art takes place. Once again situated on the banks of the Thames, this year the cream of society will come along to savour the performances of Bryan Ferry, Burt Bacharach and Joss Stone, to name but a few. After having dinner served at The Riverside Restaurant over seen by head chef Albert Roux listen to the Music, watch the fireworks spectacular and then round it off with the wit and humour of Jasper Carrot and Alistair McGowan. Team Tactics loves and prides itself on putting on the best for our clients and over two weeks in Henley we do our best. London sunshine brings companies out to play for fun team building!